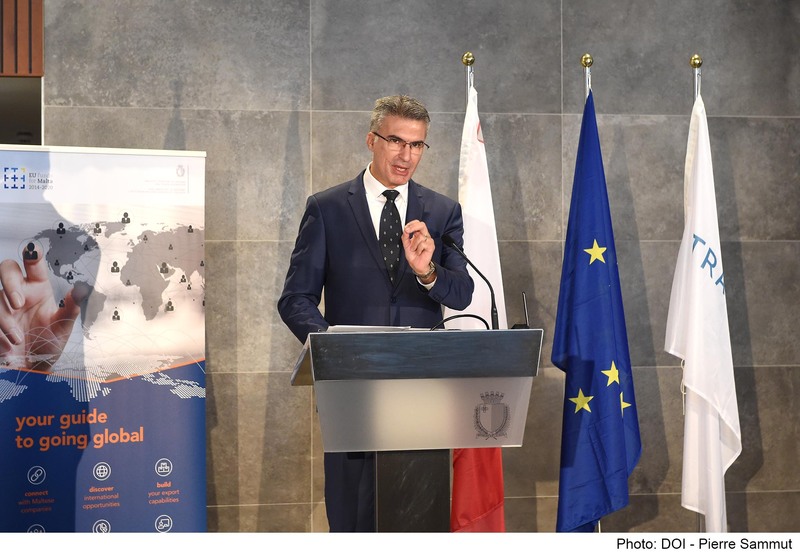 Minister for Foreign Affairs and Trade Promotion Carmelo Abela inaugurated new information services to be offered by TradeMalta to Malta-based companies interested in exporting to international markets. Companies selling goods and services abroad will now be able to access knowledge resources including market reports, eLearning content, and information on opportunities online. During his inauguration speech, Minister Abela said, that “the government is committed to assisting Malta-based companies to reach new heights in international markets, and to encourage more and more entrepreneurs to consider going global”. He went on to say that the growth of the economy needs to continue being driven by international business, and that this is facilitated by the country’s political and commercial ties with world markets and made a reality by the interventions of trade promotion organisations like TradeMalta. Minister Abela continued by saying that, “information is power. For companies based in Malta, keen to learn about different markets and the opportunities they might present, credible information on markets, opportunities, and trends, reduces the risk associated with exports. This portal gives them yet another important tool to use while planning and executing their internationalisation”. Co-funded by the EU (under the European Regional Development Fund), TradeMalta’s new portal promotes companies based in Malta, provides access to information useful for internationalisation and serves as a platform for local companies to apply for TradeMalta’s assistance. The project has enabled TradeMalta to employ and train two members of staff who will offer enterprise-level information services to exporters for the years to come. The development of the portal and its associated services is an investment of over €800,000. According to TradeMalta Chairman Stephen Sultana, the public-private partnership has become the first port of call for Malta-based companies interested in exporting or exploring global markets in some other way. In the last three years, TradeMalta assisted hundreds of companies in their internationalisation efforts, hosted the first edition of the Malta International Business Awards, trained over 60 participants in export management, and led more than a hundred companies in trade missions to new markets such as India, Ghana and Japan. Mr Sultana said that TradeMalta wants to increase and strengthen the support it offers to local exporters with the introduction of these information services being an important milestone since it was set up. For the inauguration, TradeMalta invited Scottish Entrepreneur Fraser Doherty to share his experience with local entrepreneurs.